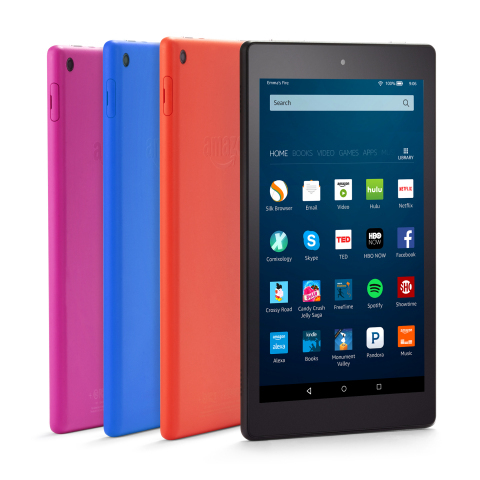 SEATTLE--(BUSINESS WIRE)--(NASDAQ: AMZN)—Amazon today announced the all-new Fire HD 8, the next-generation Fire HD tablet designed from the ground up for all-day entertainment. With an 8” widescreen HD display and quad-core processor, Fire HD 8 now offers an incredible 12 hours of battery life, 50% more RAM for faster performance, and 2x the on-device storage, plus support for up to 200 GB of additional storage via a microSD card—all for only $89.99. Fire HD 8 also introduces Alexa, the cloud-based voice service, for the first time on Fire tablets—just press and ask—Alexa can play music, launch games, read audiobooks, and more—coming soon.